The BSD variants make it difficult to quickly determine your iSCSI initiator name or iqn but I’m told they are working on a solution. 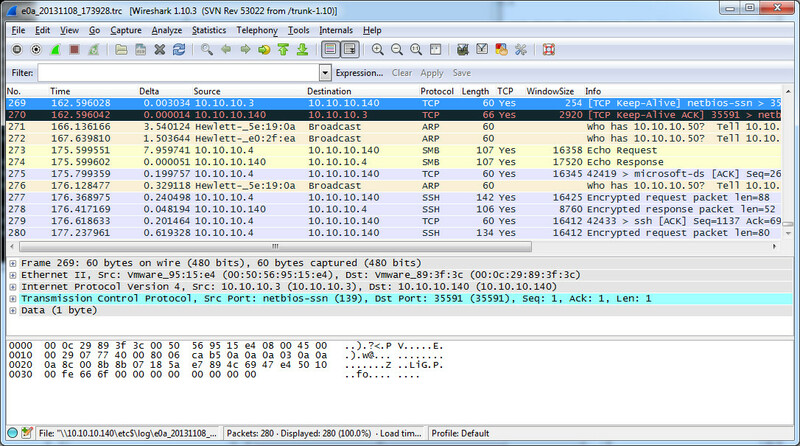 While sniffing packets is an effective method of discovery, it’s simply far to cumbersome in a busy IT shop. If you know of an easier way to display the initiator please add a comment below and I’ll post it. This post is a followup to my previous list of ways to display initiators on various platforms. 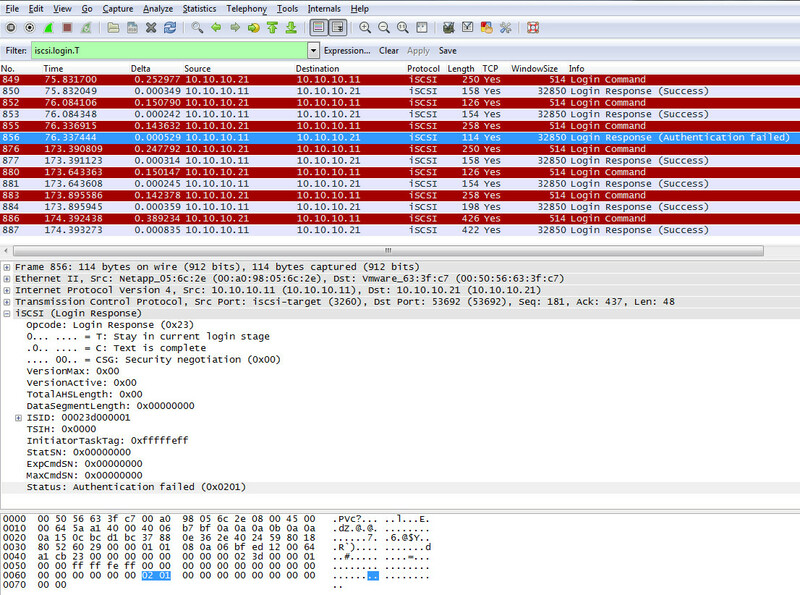 I have not tested this with the other BSD variants but assume the packets would be the same. 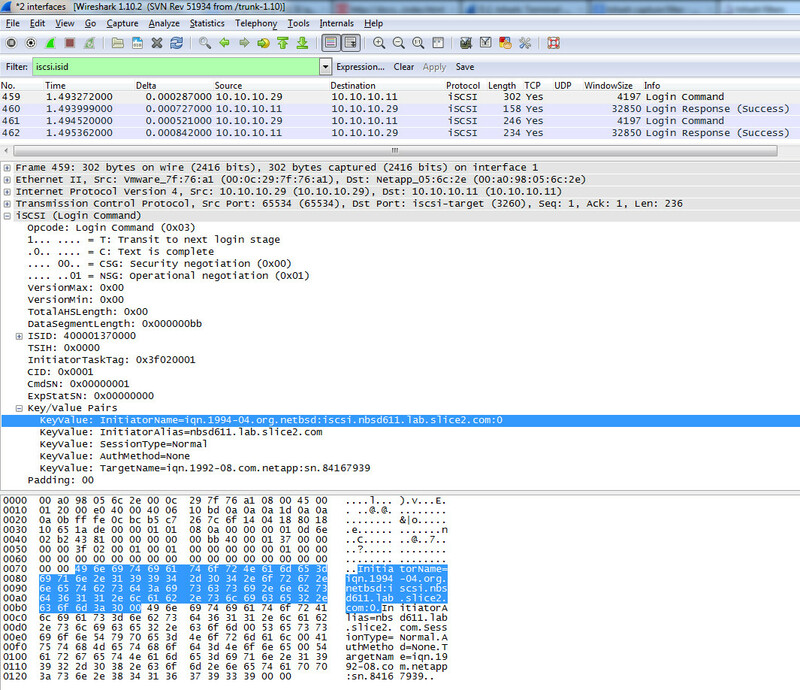 1) Install Wireshark on the NetBSD server. 2) Make sure iscsi is started on the NetBSD server. 4) Refresh your target list. 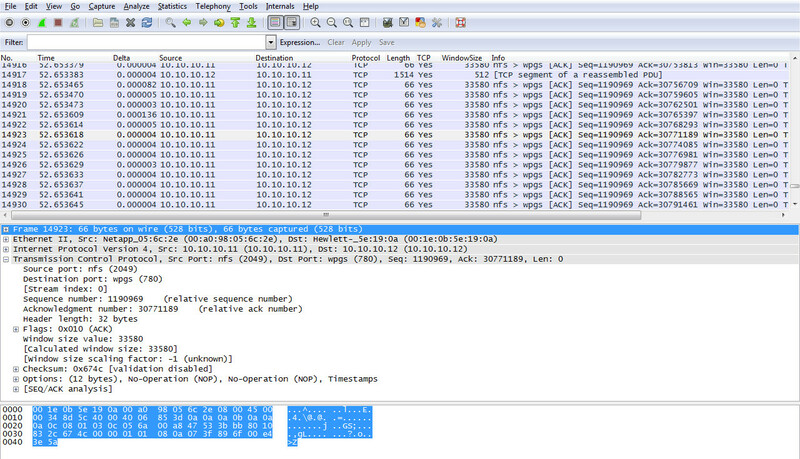 6a) In the Wireshark GUI, click Capture > Start to initiate packet sniffing. 8) Login to the target. In this case we’ll use target 2. 9) List your iscsi session with your target (storage array). 10) Stop the packet sniffing. a) Click on Capture > Stop. Note: click image to enlarge. The next two steps are depicted in this image. b) In the upper left, in the Filter: field enter “iscsi.isid” without the quotes and on the right click Apply. 11) Select the first packet from your server. In the middle expand iSCSI (Login Command), and then expand Key/Value Pairs. The first entry should list the InitiatorName= value. That is your iSCSI initiator or host iqn. In this case it’s iqn.1994-04.org.netbsd:iscsi.nbsd611.lab.slice2.com.